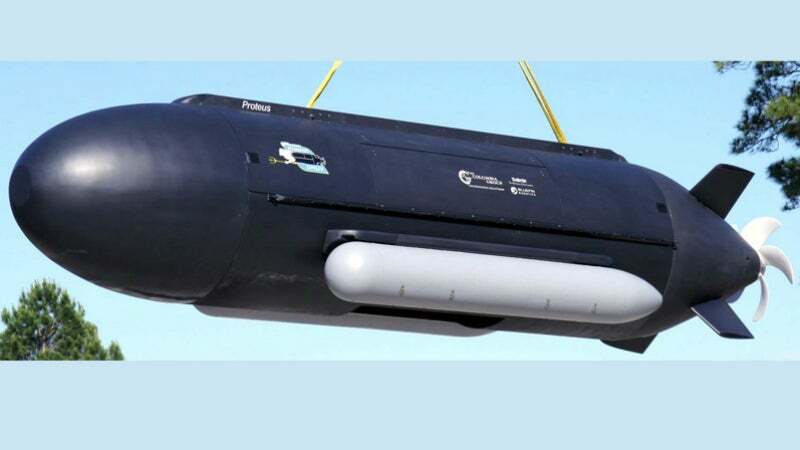 The Proteus dual-mode underwater vehicle is developed by Battelle and Huntington Ingalls Industries. The Proteus submersible vehicle underwent a 30-day endurance testing in 2016. Image: courtesy of HII. The Proteus accommodates up to six divers in manned swimmer delivery vehicle mode. Image: courtesy of Joe Colamaria/HII. Proteus is a next-generation dual-mode submersible vehicle developed by Battelle and Huntington Ingalls Industries’ subsidiary Undersea Solutions Group (USG), to meet the operational requirements of the US Navy. Featuring large cargo capacity, the underwater vehicle is intended to transport cargo or divers to multiple locations at long ranges. Other mission capabilities of the vehicle include inspection of undersea infrastructure, integration and testing of payload systems, installation of equipment on the ocean floor, autonomy development, and long-range and duration trials. The vehicle was exhibited during the Navy League’s Sea-Air-Space Exposition 2016 held in the US. Bluefin Robotics, a subsidiary of Battelle, and The Columbia Group’s Engineering Solutions Division (now Undersea Solutions Group) partnered for the development of the Proteus underwater vehicle in February 2012. Bluefin supplied the power solution, autonomy technology and mission planning capabilities for the vehicle. The battery charging and systems integration support were provided by Battelle. Proteus underwent a simulated unmanned mission in a test tank at USG’s facility in Panama City, Florida, for a period of one month in 2016. During the endurance test, the underwater vehicle travelled for 2,412nm achieving a submerged endurance of 720 hours. "Proteus can operate in two modes, manned swimmer delivery vehicle (SDV) and fully-autonomous unmanned undersea vehicle (UUV)." The Proteus underwater vehicle is 7.8m-long, 1.61m-wide and 1.62m-high. It has a maximum cargo capacity of 1,632.9kg and its cargo hold is 4.81m³ in volume. The vehicle features four tail planes, arranged in X-tail configuration. The cargo bay has a 1.52m-long and 0.54m-wide door opening for deployment of loads. Proteus can operate in two modes, manned swimmer delivery vehicle (SDV) and fully-autonomous unmanned undersea vehicle (UUV). The manned configuration is equipped with six air stations. An optional air module is placed in the centre cargo space to support the operators for up to 10 hours. In unmanned mode of operation, the UUV executes missions based on the pre-programmed waypoints. Additional features of the Proteus include automated ballast and trim systems, fly-by-wire controls, and optional external cargo pods. The submersible vehicle is equipped with two masts for mounting navigation and communications sensors. It employs VHF radio, Iridium satellite communications system and FreeWave communications, for operations on the sea surface. A combination of Benthos acoustic modem, OTS Diver communications and internal intercom is used for submerged communications. A fully-integrated navigation system featuring a global positioning system provides accurate positioning. An RDI doppler and a fiber optic gyro-based photonic inertial navigation system are used when the vehicle is submerged. The underwater drone also carries four cameras for monitoring and surveillance, 1TB network-attached storage server for storing the data, and a 300kHz multi-beam sonar for detecting obstacles. The undersea vehicle is powered by an electric motor, driving a five-blade propeller. It is fitted with two vertical and two horizontal thrusters to ensure better manoeuvrability. Power for the onboard equipment comes from Li Polymer batteries. Proteus also features an energy storage system having a baseline capacity of 148kWh and an extended capacity of 296kWh. The submersible vehicle has the ability to operate to a depth of 150ft in manned mode and can reach up to depths of 200ft when operating in unmanned mode. Proteus has a maximum speed of 9kt and a variable ballast capacity of 521.6kg.